South Sudan’s First Vice President and former rebel Taban Deng Gai on Monday formally merged his party with the ruling Sudan People’s Liberation Movement (SPLM). The move is designed to strengthen the legitimacy of Salva Kiir’s regime at a time when political divisions are intensifying once again. On Monday, President Salva Kiir also publicly his forgiveness of rebel leader Riek Machar and asked him to return to South Sudan. 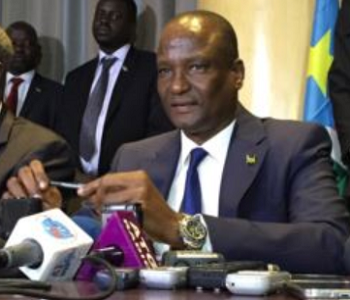 Taban Deng Gai, a former rebel and ally of Riek Machar in the SPLM-IO, took over from Macher as South Sudan’s vice president in 2016 after the pair fell out and split the rebel group in two. Both factions under Deng and Machar held on to the name SPLM-IO but Deng’s supporters abandoned the rebel cause to support President Salva Kiir’s regime. Now, Deng is merging his faction with the ruling party in an attempt to strengthen Kiir’s position in power. “Nobody would believe that I would call for Riek to be brought, but I said bring him because Riek is a citizen of SouthSudan. What we are doing here is forgiveness. Riek is a citizen of South Sudan and he will return,” he added.